To introduce a hierarchy of ruling caste, Washington insisted on distinctive decorations of dress in accordance with minute gradations of rank. As one observer phrased it: “New lords, new laws. … The strictest government is taking place, and great distinction is made between officers and soldier. Everyone is made to know his place and keep it.” Despite the great expense involved, he also tried to stamp out individuality in the army by forcing uniforms upon them; but the scarcity of cloth made this plan unfeasible. Distinctions of rank, uniformity of appearance, differentials in pay, the employment of coercion. I don’t know about you, but to me this sounds like…an army. The “yeah, so?” factor seems to be a recurring issue in libertarian-oriented historical polemics. I’m reminded of Thomas DiLorenzo’s work on Lincoln. There’s nothing really new or useful added to the mix in terms of what we know about the past. The only original ingredient is the author’s opinion that the developments in question were for the worst. It’s a sort of inverse Whig interpretation of history, a narrative of regression away from freedom and toward authoritarianism. Rothbard was of the opinion that Washington should have left well enough alone and allowed the Americans to fight a people’s partisan war, since “they were not professional soldiers, and they were needed at their homes and jobs and on their farms. Had they been a frankly guerrilla army, there would have been no conflict between these roles.” And yet there was a conflict between the roles of partisan warrior and civilian farmer. We know this because the militia who fought without joining the regular Continental Army tried to balance these roles, and their inability to be in two places at once—embodied in the field and back at their homes—was one of the most important limitations on their effectiveness. Rothbard, I think, made the same mistake which contemporary advocates of a home-grown American genius for partisan warfare made. The hardy frontier riflemen who could pick off British soldiers from a vast distance and then vanish into the woods played an indispensable part in the American victory, but they didn’t do so alone. More importantly, they weren’t typical of the American population. Revolutionary America needed a regular army to win the war, and that army had to be molded into a force capable of going multiple rounds with the British, something Washington and the other Continental commanders came to realize. The measures they took to bring this about may have been restrictive and authoritarian, but if you value individualism above all else, then it’s unlikely that any hardened fighting force is going to be congenial to you. Mort Kunstler unveiled his newest painting last night at the New York Historical Society. It depicts Washington’s crossing of the Delaware in a much grittier, more realistic fashion than Leutze’s classic canvas in the Metropolitan Museum of Art. You can get a look at the painting by clicking here. I love it. It’s aesthetically pleasing, but it doesn’t sanitize the harsh reality of the soldiers’ situation—these guys are cold and wet. 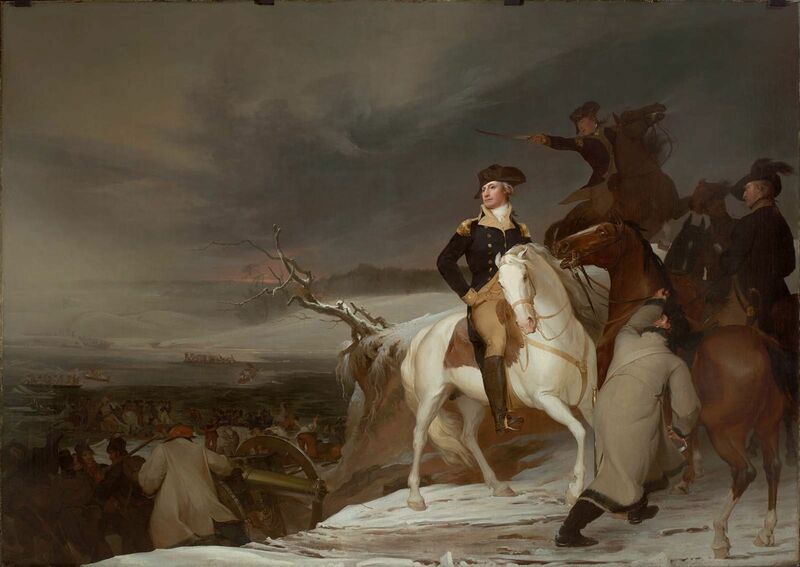 The painting also conveys Washington’s heroic stature without sacrificing the credible naturalism that Leutze tossed out the window. If you ask me, Kunstler’s depiction does more credit to the bravery and determination it took to launch the attack on Trenton, because it shows us ordinary men overcoming miserable conditions. Now, when do we get to buy prints? Passage of the Delaware, by Thomas Sully (1819). Now in the Boston Museum of Fine Arts. Security cameras got the whole thing on video. Have a look and see if you recognize this creep. There’s a reward offered for information. We’ve seen far too many examples of this sort of thing in the past year, and potential thieves need to learn that they can’t steal from museums and archives and expect to get away with it. More bleak news about the travails of trying to manage a cultural attraction while the economy’s in the toilet. When I was an intern, I spent a fair amount of time manning a cash register in a museum lobby. Some visitors used to complain about admission costs (a paltry four or five bucks per adult back in those days), remarking that we must have been glad we such a nice little cash cow going. They were so wrong it wasn’t even funny. In many museums, admissions revenue rarely even comes close to meeting operating expenses. Indeed, in many cases, it doesn’t even cover basic maintenance costs. Keep that in mind the next time you feel like griping to the guy at the ticket counter. You know that old saying about how nobody ever went broke by underestimating the public’s intelligence? Last year, the History channel had a growth spurt, gaining hundreds of thousands of viewers while most of its competitors struggled to grow at all. This year, even more remarkably, the channel did it again. Its biggest show for the last two years has been “Pawn Stars,” about a family that buys and sells watches, necklaces and artifacts. Just last week, History scheduled a spinoff, “Cajun Pawn Stars.” But the channel is also considering shows that may seem suited for TNT or even ESPN, like a “Hatfields and McCoys” mini-series and a jousting competition. The goal, it seems, is to steal market share from the other big boys. History has been able to declare its “best year ever” for five years in a row because it took what could be seen as a radical turn away from its brand nearly five years ago. For that, we can thank Nancy Dubuc, The History Channel‘s general manager. As you might recall, she’s the same person who had the grapes to refer to shows like Ice Road Truckers and Pawn Stars as “vérité documentaries on people doing history today.” There’s a sense in which that’s true, but it’s the same sense in which Uwe Boll is a bold iconoclast on the cutting edge of modern cinema. So what can we look forward to in the future? “They like that it’s loud, it’s promotable, and it’s different,” he said. Note to self: Come up with “loud, promotable, and different” idea for TV show, pitch it to The History Channel, bask in riches and glory. Next year they’re rolling out (I’m not making this up) a mini-series about the Hatfields and the McCoys. If they can handle this difficult aspect of Appalachian history with the same sophistication and sensitivity so characteristic of Swamp People and Only in America with Larry the Cable Guy, then we’re in for a real treat. There’s a dispute going on in Princeton, NJ over a parcel of land that may or may not be a critical piece of the Jan. 3, 1777 battlefield. Enlisted to speak for those wishing to build on the site is Dr. Mark Peterson, who argues that the case is not as clear-cut as opponents of the project suggest. For all I know, he may be right about that. Dr. Peterson suggested there are other ways to memorialize historic events, in addition to preserving the land from development. He pointed to several sites that were important in the Revolutionary War, but that have since been developed and do not reflect the way they looked in the 18th century. In Lexington, Mass., where the first shots of the Revolutionary War were fired, the bodies of the American militiamen who died were buried in cemeteries scattered around the area, he said. But many years later, the bodies were disinterred and reburied next to a monument that was placed on the site. A plaque at Cambridge Common, which also figured in the Revolutionary War and which was the site where Gen. Washington took command of the Continental Army, is part of Harvard Square. Land has not always been set aside as “sacred ground,” Dr. Peterson said. This reminds me of an argument I used to hear in support of the Gettysburg casino. There’s plenty of schlock around the battlefield already (as this line of reasoning went) so it makes little sense to freak out over a single gambling resort. I’ve never found this persuasive. One could just as easily make the same argument about natural resources: People used to clear-cut forests with merry abandon and shoot down every bison in sight, so what’s the big deal? Lousy stewardship of historic ground in the past shouldn’t be a license for us to proceed carelessly today. If anything, it should serve as a cautionary tale.